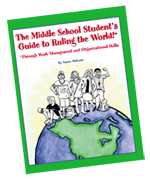 Messy binders, missing assignments, failure to follow directions, poor study skills, clueless about college prep… Are you worried your child is headed to middle school with zero time management skills, unable to handle the increased workload? Do you have a student who will soon enter the high school fast track with no study skills, and little understanding of the college path process? You’re not alone! Most students need help with organizational and study skills, and few students enter high school with any real understanding of the college prep process. Tween’s fun and student-friendly resources are a great way to learn these essential skills. 16 chapters in work habits, time management and organizational skills. 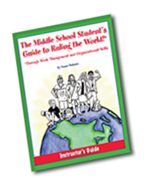 This popular resource uses text, comics, characters, and plenty of graphics to help your student learn practical skills for success in middle school. Follow along with the students of U.B. Smart Middle School as they learn how to organize a “goof proof” binder, manage a group project, read a rubric, remember day-to-day responsibilities, successfully self-advocate, set goals for success, and much more. Ten free audio podcasts make learning these skills a breeze! Ideal for independent learning. 28 chapters cover how (and why) to be a metacognitive student, learning and intelligence styles, pre-learning strategies, active learning, reading & listening, Cornell and Matrix notes, mnemonics, time-spaced learning, test-taking skills and strategies, distance learning, critical thinking, information literacy… You name the skill, this student-friendly resource covers it. Easy-to-read text, comics, characters, worksheets, and activities makes learning good study skills painless. Ideal for classroom instruction or independent learning. These skills matter from middle school through college. The middle years are key for getting and keeping students on the path to college. 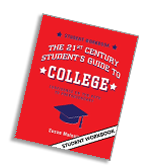 14 fun chapters teach students about the lifelong benefits of postsecondary education. It also appeals to their lighter side by demonstrating that college will be one of the most enjoyable experiences of their lives. 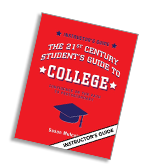 By the time students complete this book they’ll understand key concepts about college prep, college selection, applying to college, campus life, alternative postsecondary paths, study abroad, scholarships, loans, and grants, majors, degrees, and postgraduate goals — even a little about college sports. Your student will have a working vocabulary of over 100 college path terms! Ideal for independent learning. Full product previews are available on the individual products pages under the Resources tab on the Home page.